One of the main decisions women need to make when planning to purchase tool belts is finding a properly fitting belt. Small sized women often face an arduous task to find a fitting belt in the store because most belts are designed for men. The average woman would like a tool belt that doesn’t look generic either. So, it’s the fit and style that we are considered about but also durability and features that make the tool belt efficient. Read on to find our top pick for women’s tool belts. First, we need to define what a women’s tool belt is, how it works, and why you need it. Gone are the days when only men worked on repairs at home. Now, even women can do it and we want to do it. For safety purposes and for looking like we are pros on the job, we need a fantastic tool belt that will help our DIY projects and repairs more efficient. You need to have easy access to your tools to efficiently complete whatever task you are doing such as carpentry, electrical and plumbing task. Tool belts are specially designed to hold on to tools and supplies and keep them within your grasp so you will have free hands to work. This way, you won’t have to keep looking for the tools you need while you’re holding on to heavy plywood and metal. With all the essential items properly arranged and organized in one place, you will better maximize your time and effort. You won’t need to bend down to pick up things or ask need assistance from someone to help them pass things while they are doing tedious work. That is one of the reasons why tool belts are so common to with men, women, and DIYers. Therefore, if you need to select a tool belt, choose one that rightly fits your new project. Once you have identified the type of belt that will fit your waist, you need to choose then your belt based on the type of work you do. Whatever kind of work you do, whether construction work or simply need a tool belt for light housework we have reviewed some that will suit your specific purpose. All the belts we would review in this list can be easily adjusted to fit into a range of waist sizes. 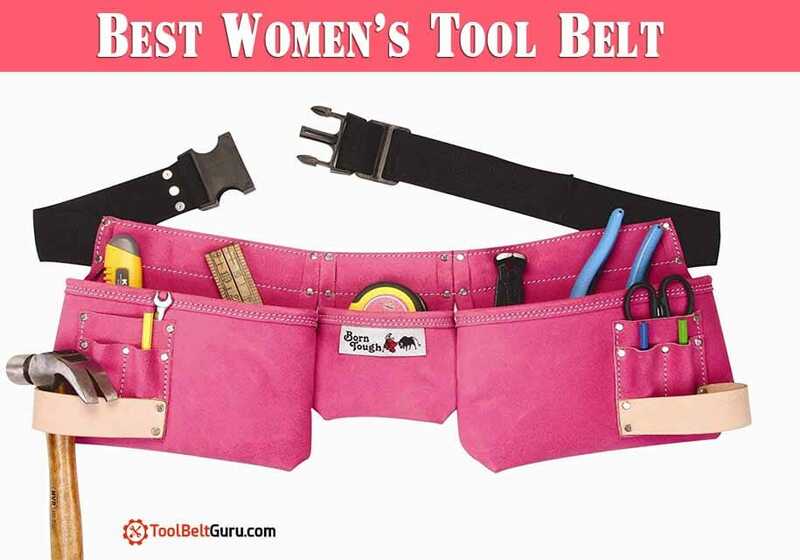 A summary of the best women’s tool belt has been carefully organized in a comparison table below to help you easily make a decision based on the rating, cost, material, and size. Above the comparison table detailing the specifications of each woman’s tool belt, we would review. The Leathercraft heavy duty work apron has an expansive space to keep lots of things. The apron has four main compartments and three additional smaller compartments that can be used to store small tools like pliers. It also comprises of a center pocket which helps to hold steel hammer loop and tape measure. The belt has a width of 2 inches made of the poly web with a quick-release buckle. It is designed to be adjustable to the waist size of between 29 inches to 46 inches. This product is our top women’s tool belt pick because of its functionality and capacity to accommodation waists of different sizes. One drawback of the Leathercraft heavy duty work apron is that it is often very stiff when you first start to use it. This means it could be a bit uncomfortable to wear with the pockets appearing too tight. After the “breaking in” period, you will be able to use this work apron without fuss. The leather is thick and does not puncture easy. This women’s tool belt adds style and swagger to your work. It features 10-pockets and several rooms for all your essential tools. It essentially allows you to accomplish your task while looking good in it. The belt’s pink color provides and an attractive feature that any female worker will love. It is a comfy, flexible belt that features a sizeable design which is flawless regardless of your job or vocation. This unique tool belt performs well for a diversity of lifestyles. If you need a tool belt capable of storing your tools (hair stylist or garden), supplies (art and craft), this is ideal for you. Users have given this tool belt a rating of 4.5 out of a 5-star. However, the extremely low price and its storage capabilities appear to overshadow its durability or quality issues. In any case, you’ll get a lot of use of this product. It’s cheap price will make it easy to replace with wear and tear. If you’re on the lookout for durability, convenience and style all in a package, then look no further as the born tough suede leather women’s tool belt is the perfect fit. The tool belt features nine amazingly roomy pockets which keep all your essential tools and materials. Whether you are working around your house, garden, or in the garage, you need something durable and adept at keeping up. The Born Tough tool belt makes you look more than tough enough to take on whatever tedious job comes your way. Don’t be deceived by its pink color as it’s strong enough and capable of keeping up despite the kind of work you do. This product has been given 4.6 out of a 5-star rating. This product is a versatile women’s tool belt that features five different pocket sizes and two hammer holders. Essentially, this belt can contain all you need. Aside from handy pockets, this belt is one of the best women’s tool belts as a result of its wide-ranging adaptable belt. The sizing could be adapted to within 30 and 45 inches, thereby making it possible to fit all sizes of women. The belt has a fast to release buckle and a width of 2 inches wide. This product is quite cheap, and it does what it is expected to do efficiently. If you are on a low budget, but you still fancy an efficient tool belt, then this product will do the trick for you. The buckle can be finicky. If you need a simple, nonetheless stylish female tool belt, this tool belt could do the trick. Although it doesn’t have as many pockets as those mentioned above, it is still ideal for regular daily use. This tool belt is ideal for small jobs within the house, garden, and within the garage. Grip women also come handy for those looking for convenient, fast access to some personal supplies. Users have rated this useful tool belt and given it a rating of 4.3 out of the 5-star review. While choosing a tool belt to use, one of the first things to consider is the material that it’s made of. The type of materials will also determine to a large extent your chosen attachment durability, looks, and weight. If your work demands you to use a heavy-duty gear, then you should go for the leather option. The leather tool belt is resistant to abrasion and moisture, and it has enough durability to last you for several years. The other option aside from leather tool belt is the synthetic utility belt which is mostly made of nylon or polyester. Their durability and price may vary based on its design and fabric density. Also, note that polyester models might not be as wear-resistant as the leather tool belts. However, it boasts of a lightweight design and an excellent quality for the price which has increased its popularity in the market. If you know your waist measurement, you should ensure you pick the tool belt suitable for your waist and size. Most models come in various sizes while other items come in free size. Concerning the closure, utility belts are often fitted out with a reliable double-tongued steel roller fastener. Some come with comfy, fast release buckle, though enough to carry weightier things. If you are in such categories, then you should look for tool belt with this option. In this case, you should choose based on your needs. For instance, a model that comes with two roomy bags and several pockets to keep power tools and other items are ideal for those whose work deals with height. For little DIY projects and household tasks such as minor repairs, hanging a bookshelf, you may need to go for a more compact accessory that has one or two bags. Now we need to discuss comfort and convenience. A wide cut padded belt will enable more comfortable back support, which comes handy when your task requires spending long hours at work. Most tool belts have removable bags that allow easy swapping around for left-handed use. Some belts also possess ergonomic handles for carrying. Suspender rings let you attach shoulder belts to have an equal weight distribution. If you have an accessory with suspenders, you would not need to buy them independently. Aside from having pockets of varying sizes, some models come with handy tool holders such as a tape chain or hammer loop. Largely, all the women’s tool belts aforementioned offers great benefits. If you are in need of a quality, convenient, and easy to access tool belt for all your tools and supplies, you should choose any of the above. You should also note that the price of a tool belt doesn’t necessarily guarantee quality and effectiveness. Therefore, you should pay more attention to its features and how well it fits into your use than the cost. The best doesn’t have to be very expensive, shop smart! We have reviewed these five top products for their strong features and attractive looks not for their price. We hope this will guide you to make a sound and smart purchasing decision. Make sure to check www.toolbeltguru.com for more reviews.